InvestHER recently sat down with Stephany Rose Spaulding to talk about what it is like to be a candidate for the U.S. House of Representatives. Everyone deserves to have representation in Congress and since 1972 there have been whole communities left without representation in Colorado's 5th Congressional District. Now is the time to change this and elect someone concerned about all her constituents. My mission is to provide Colorado’s CD5 inclusive, transformative and forward thinking leadership. While I have been civically active throughout my life, the nudge to run for office came as a result of my participation in the 2017 Women’s March in Washington, D.C. At the end of that day, I recognized that we could not allow the result of that action to be simply a moment; it needed to be a movement and we collectively needed to dig deeper. Running for office is my way of digging deeper and giving more to my communities and country. I am currently a tenured professor and chair of our program of women’s and ethnic studies at the University of Colorado, Colorado Springs. I attended Clark Atlanta University for undergraduate studies and Purdue University for both my Master’s and Ph.D. My arrival to Colorado was for my tenure-track position at UCCS and I have loved every bit of my journey here in Colorado. Additionally, I became a licensed minister in Oct. 2012 and was ordained as the pastor of Ebenezer Baptist Church September of 2014. My focus professionally, pastorally, and civically is to seek justice, diversity and inclusive practices for the progressive transformation of society. Healthcare: Affordable and accessible health care is a right for all Americans, not just a privilege for some. I understand that the Affordable Care Act (ACA) needs reform, but plans to repeal and replace have been about scorekeeping and not about assuring we have viable health coverage. Additionally, the efforts to cut back services to women, veterans, rural and underserved communities do not reflect the values at the heart of our democracy and gravely impact our district. Education: Public education in the United States needs considerable attention and reform so that all learners from pre-K through college receive an excellent and equitable education. Regardless of zip code and income level, our district deserves a representative who lives our values. Specifically, creating legislation that provides internet access to our rural communities, reduces the cost of higher education, and provides diverse opportunities for students that want to further their education are priorities for me. Additionally, we must create more opportunities for members of our community who want trade certificates and hands-on job experiences. Economy and Housing: Our nation’s economy is changing, and we need to bring back innovation to our entire region that will create jobs that last. Based on our natural and human resources our district has the unique opportunity to become the Green Silicon Mountain of the nation through sustainable technologies. Also, our relationship with our military communities will allow us to experience economic growth through cyber securities and technologies. Working strategically with our educational institutions, innovators, as well as public and private industries will bring sustainable economic growth to our district. Economic growth and job creation will aid in addressing the housing crises faced as well throughout our district. Rapidly, we are becoming one of the most expensive places to live in the country. Sustainable wages, new job opportunities, and an affordable housing market—with opportunities for low-income housing—provide the foundation for viable communities. Traditional winning is not the sole purpose of my congressional run. Winning for me includes inspiring others to be courageous in their own lives for the people and causes they love. During our first weekend of action a young African American woman, not older than 24, walked in our campaign door extremely excited to volunteer. She knew very little about me but had found our call to action on the Justice Democrats website and knew she wanted to check us out. As we left in teams to go canvassing, I asked if she would not mind going door to door with me personally. We had a blast and she continued to volunteer with the campaign as much as her student-mother life would allow for the weeks to come. She participated in caucus for the first time and became a delegate to our county assembly. 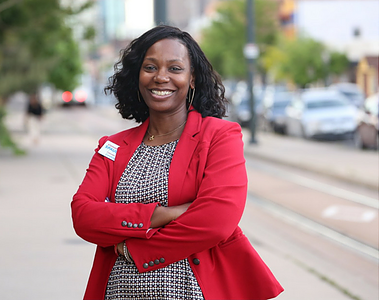 At assembly she, like everyone else, learned that El Paso County had an ambitious goal of getting people to run in every available race this cycle. After learning that her House District had no candidate, she felt courageous enough to step up and run in this cycle for the seat. While I know I can not take credit for her decision, this is my favorite story thus far on the trail because I have had the privilege of meeting and witnessing young women who are often marginalized take ownership of their voices and step out to transform their communities. This too is what winning looks like to me. I need network and fundraising support. Sharing my story with other women locally, regionally and nationally is of great concern for our campaign. While we are making tremendous strides in the District, enhancing visibility for name recognition is an absolute must. Thank you for the opportunity to share my campaign with you InvestHER. I would be honored to receive your support as we make history here in Colorado’s 5th Congressional District!